Do you have a Star Wars fan in your house? Maybe a father or a husband? Well then, this gift will be perfect for you! Last year, I told you how my husband (and father of my 3 beautiful girls) loves Star Wars. I made him a custom Boba Fett shirt last year. Well, this year, I wanted to keep with the Star Wars theme and give him something he would love and use: a glass mug / stein. If you're of my generation and can remember seeing the original trilogy for the first time, you probably remember how shocking this exchange was and how it changed the perspective of the rest of the movies. But Darth Vader never actually says, "Luke, I am your father," as it is commonly misquoted. But enough geekery...I thought it would be fun to have a Darth Vader silhouette with the real quote on a glass mug for my husband. The fun thing is that you can easily find silhouettes of Darth Vader online that the Silhouette Designer Software can trace, and the font is a free one called star jedi. 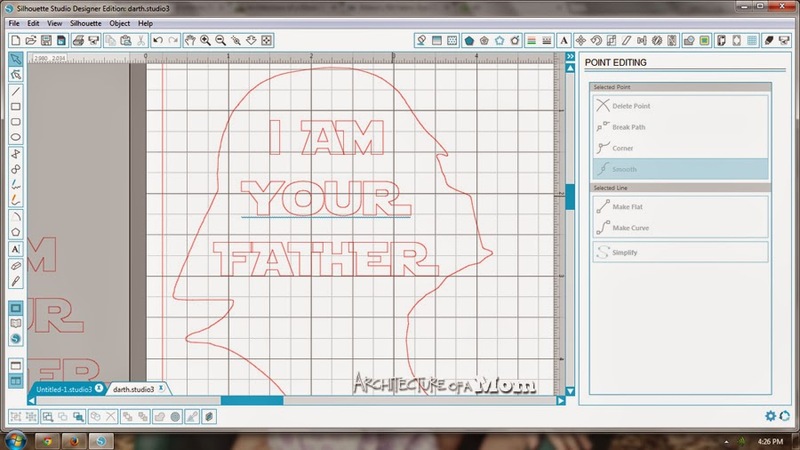 First, Bring your silhouette image into the silhouette software. Use the trace function to get your shape, modifying the threshold as needed to get the shape you want. You'll probably have to delete vertices and clean up the shape a little. Then type yout text and apply the font and size you need. Note that my letters are not joined yet, although some overlap. Then, ungroup the letters (now they are shapes!). Move them as needed and weld them into units of several letters as it makes sense for your verbiage. Cut out the artwork onto stencil vinyl—you can use regular vinyl too, but the silhouette stencil vinyl that comes in teh etching starter kit is supposed to leak less. Make sure your surfaces is clean, and then clean it again with rubbing alcohol to get rid of the oils your hands leave behind. Let dry. Use transfer tape to transfer the vinyl onto the mug. Press down the vinyl onto your glass surface really well, making sure you don't have any bubbles near where you will be etching. Apply the glass etching cream according to the instructions. You want it to be thick enough that you can't differentiate between the vinyl pattern and the bare glass, so that your etched area is as uniform as possible. I like using a disposable plastic knife for this. Leave on for the amount recommended by the etching cream. Remove as much as you can (with your plastic knife) and then rinse it off with water. Dry well, and then remove the stencil vinyl. Wash the whole thing well again (you know, just to be safe) and then let Dad enjoy a yummy root beer float or other beverage to celebrate his day!